72 km / 44.7 mi. Felt great. Had three guys to follow, which helped a lot. Surprisingly, went past them all in the last k. Even had a good kick. So while it's not "fast,' given my past performance, it's the best I've run in quite a while so I'll take it. Weather: 18C/64F. felt cool. This is the ideal temperature for me…. Weight: 57.4kg (56.8 before the run). 3:30 - 12k easy in 1:05:45 @5:28. Legs felt fine. 2:00 - 13k with 3k warmup, 4k, 3k, 2k hard. 4k in 16:48 @4:12 (walk 6:00), 3k in 12:15 @4:05 (walk 5:00), 2k in 8:08 @4:04. Felt good. A little soreness in hip joint the last 500m, so abandoned the plan to do 400 x 2, 200 x 2. 2:00 - 12k easy in 1:04:17 (different course, may have been a bit short). That was a great 5km.Keep it up. Good time for an old bloke Bob. 18:57 is way better than 19:01. 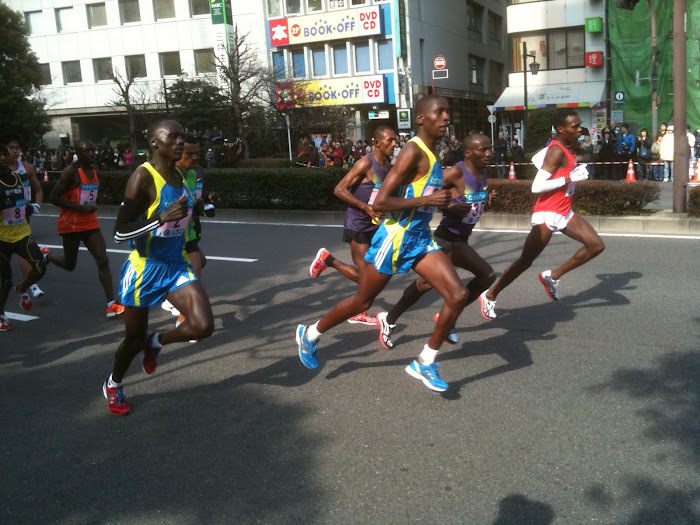 Although he was a km behind, Kawauchi had a crack to stay with the pack, which I like. Amazing that he only took 1/2 a day off work, flew straight back and was at work the next day! Man, they are very nice splits for that 5K. Good job. This may be a silly question but why did your weight increase after that run? Or am I reading it wrong? Mark - well, I ate a lot that night. Good 5 Km time. Well done.